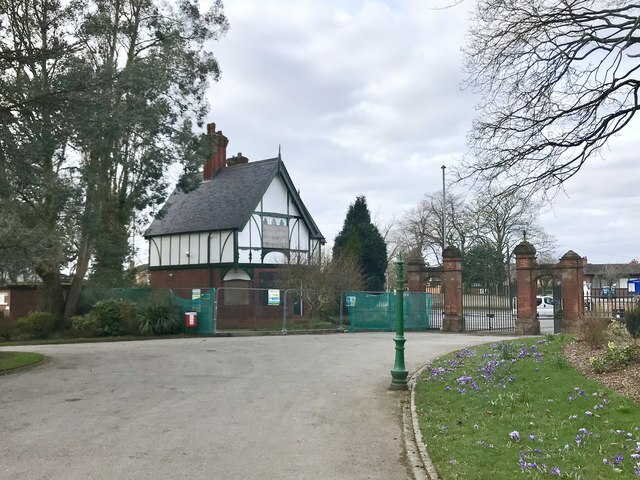 "At the north corner of the park is a large, two-storey lodge in the half-timbered Queen Anne style, originally the home of the Park Superintendent. To one side is a toilet block in similar style, and to the other an impressive entrance with tall brick gate piers, main iron gates decorated with the crests of the Duke of Sutherland, the Mayor and the Borough of Longton, pedestrian side gates, and splayed walls with elaborate iron railings." (from the Historic England listing). It was the first public pleasure ground in the Potteries. For this and the following other reasons it is listed as Grade II*: the park is a good example of a later Victorian municipal park in an industrial town; its design is essentially unchanged from its original layout of the 1880s; the park was designed and laid out by the Duke of Sutherland’s Land Agent John H Garrett; it retains various C19 park structures, many locally manufactured; and good mature trees survive, with tree-lined paths and drives.